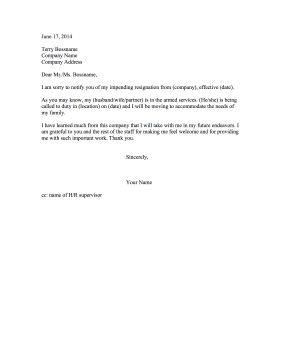 Relocation for a military family member is the impetus for leaving a company in this armed services resignation letter. I am sorry to notify you of my impending resignation from (company), effective (date). As you may know, my (husband/wife/partner) is in the armed services. (He/she) is being called to duty in (location) on (date) and I will be moving to accommodate the needs of my family. I have learned much from this company that I will take with me in my future endeavors. I am grateful to you and the rest of the staff for making me feel welcome and for providing me with such important work. Thank you.